Just last month, AMD began shipping its first 6-core, 45 nm Opteron server CPUs with "Istanbul" architecture, with the top-of-the-line 2.6 GHz, 4- and 8-way 8435 SE selling for $2,649 in 1,000-unit quantities ("trays"). Perhaps ahead of schedule, yesterday AMD cut the tape for a 2.8 GHz 4- and 8-way model 8439 SE model that one-ups its own June release. Its tray price: $2,649. And while a new entry on the high end usually triggers a price drop for existing models, it may yet be too soon for AMD to drop the price of the 2.6 GHz model below its June price. In an interview with Betanews, AMD's Opteron product manager Steve Demski said that won't be much of a problem, since in this economy and with the current state of data center architecture, high wattage and higher performance are less of a factor than ever before. "In general, I won't say that the SE is a dying breed, but it's a small percentage of our overall business. We still do have some of these high-profile customers that do want that extra performance, and they're willing to pay more for it. But as a percentage of our business, I want to say it's less than five percent," admitted Demski. "Not to say that it doesn't matter to the people who want that performance; it does." AMD's strategy, revealed last May, is to address what it believes to be four market segments: a mainstream and three offshoots. The high-performance and low-power divisions are obvious, but then AMD is gambling on a lower power market segment, for server farms that are truly dedicated to "going green." Yesterday's releases address the "very high performance" and the "generally lower power" shades of these two more obvious market sub-segments, with the 2.1 GHz six-core, 4- and 8-way, low-power 8425 HE priced at $1,514. Using AMD's Average CPU power metric (ACP), the 8425 HE is AMD's 55W part, while the 8439 SE runs at 105W ACP. In the two-socket bracket, AMD introduced a high-performance 2439 SE, which has the same power and performance profile as the 8439 SE, only priced at $1,019. The 8425's counterpart on the 2-socket side is the 2425 HE priced at $523, followed even lower down by a 2.0 GHz 2423 HE priced at $455. Meanwhile, the "older" 2.2 GHz 2427 HE remains at $455. There might not be much cause for complaint here, however. Competitor Intel's most recent price list (PDF available here) continues to show not one six-core processor in its Xeon 7400 series lower in tray price than $2,301. 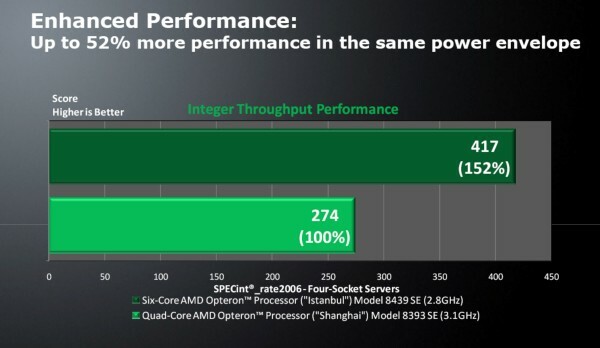 In SPECpower_ssj_2008 benchmark tests AMD conducted on the standard six-core 2.6 GHz 75W Opteron 2435 introduced last month and the 2425 HE 55W at 2.1 GHz introduced yesterday (again using AMD's metric, which doesn't align with Intel's Thermal Design Point or TDP), both processors yielded the same score of 1228 at 100% load point. "But the power consumption of the HE system is 49 watts lower [221W versus 270W] than the power consumption in the standard system," remarked Demski. "This is the exact same platform; we swapped CPUs and took the measurement again. "So you're saving 49W per 2P system. Let's do some math here: If you've got 49W of system [savings] and you have a rack of servers, you've got 42 1U servers in that rack, that's over 2,000 watts of power you're saving by going to the HE model. If your cost per watt is $5 -- which I would argue is conservative -- you're saving $10,000 a year on that one rack. And you can imagine the cloud guys -- they don't build by rack, they build by container, which has 5,000 or more servers per container." On the other side of the equation, server admins and IT professionals will be watching the benchmark charts to see if AMD's latest claim is proven and officially filed. Though the SPEC organization does not show an official claim this afternoon, AMD is claiming that a four-way Tyan Transport TX46 server with 64 GB of RAM, loaded with four 2.8 GHz Opteron 8439 SE CPUs, posted a peak performance SPEC_int_rate2006 score of 417. Compare this against the 274 score that AMD's quad-core "Shanghai" series 3.1 GHz quad-core Opteron 8393 SE posted, and you might file these results under "D" for "Duh." Here, 150% the processor provides 150% the performance -- what's new with that? The first bullet point this 417 score (if it holds up) should provide is the fact that the 8439 uses the 8393's same power envelope; you can swap out the quad-core with a six-core and not suffer a power cost. But bullet point #2 has a lethal tip to it, and again if the score holds up, it will be extremely impressive news, and the first time in years that AMD can submit a performance score to SPEC without accompanying it with lower-power explanations and best-case-scenario apologies. According to SPEC's latest list of official scores, a four-way IBM System x 3850 M2 loaded with four 2.66 GHz Intel Xeon X7460 processors -- Intel's highest performer in its six-core line, selling for $2,729 -- posted a 294 peak score on the same test. That's the highest-performing X7460 in the list; a Dell PowerEdge R900, a Fujitsu Siemens Primergy RX600 S4, and an HP ProLiant DL580 G5 with a quartet of X7460s all posted peak scores of 291. Maybe the Opteron SE series only sells to less than 5% of AMD's customer base, according to Steve Demski. But whenever AMD boasts a performance lead (and it's backed up by independent tests, which have yet to be revealed), it always manages to make a dent in 100% of Intel's customers' minds.